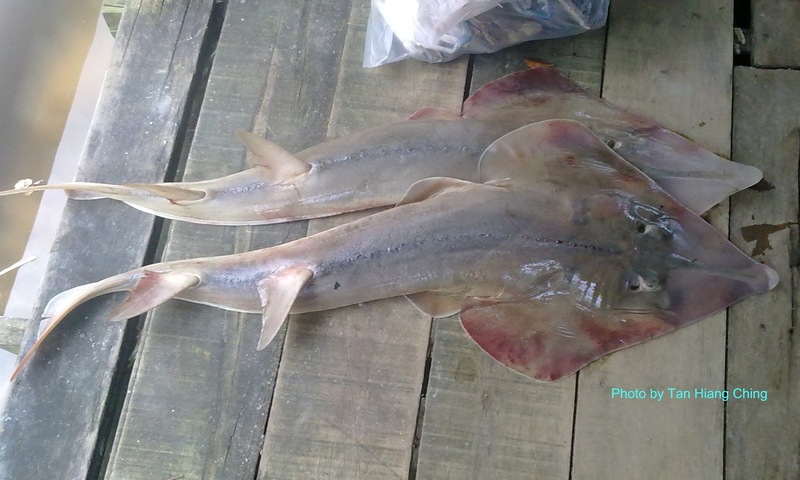 Guitarfishes and shovelnose rays are the common names for the members of the Rhinobatinae, a subfamily for the Rhinobatidae (Guitarfishes) family. They have a wing-like pectoral disc similar to the stingrays, and a sharks body. The subfamily members are distinguished from Rhynchobatinae by having their first dorsal fin originates behind anterior half of total length, base behind rear tips of pelvic fins. They also lack the lower caudal fin lobe. Members of the Rhinobatinae are found mostly found in warm-temperate to tropical inshore continental water around the world. There are 6 genera and 48 species worldwide. They often occur off sandy beaches, in muddy enclosed bays, in estuaries, and off river mouths. These fishes are strong but slow swimmers. They are commonly found near the bottom but often swimming well above it or near the surface. All species are live-bearing. They feed on benthic invertebrates and are inoffensive to human.